Mobile hospital carts can serve many uses in a hospital and other healthcare settings. They enable personnel to easily and securely store and move medications, medical records, and equipment right to any patient’s bedside. 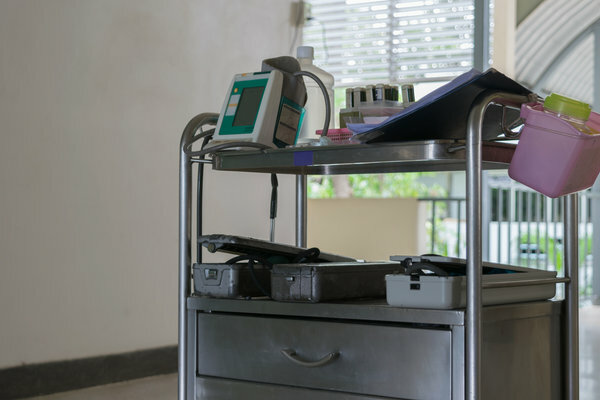 There are a variety of different types of mobile lab carts, including anesthesia carts, crash carts, IV carts, bedside carts, medication carts, treatment carts and point of care carts. When in the market for a mobile hospital cart, there are certain characteristics to keep an eye out for in order to get the best quality. The highest quality mobile lab carts are designed with a material that limits the amount of plastic and other materials that may break down, which could be a potential breeding ground for infectious agents. Aluminum and stainless steel make for longer lasting and safer carts. All good quality mobile hospital carts will have drawers that lock for safe storage of medications and supplies. The best carts will have features that alert the user if a drawer is unlocked, such as not shutting if it is open. Locked drawers ensure that all medical supplies are safely transported and stored at all times. The best mobile lab carts come with multiple compartments and drawers, allowing storage of a variety of materials and equipment. Many companies can customize the design that a healthcare provider wants and needs, so the number of drawers, baskets, and more can vary. Great mobile hospital carts should be flexible for different needs. The tabletop and monitor should be easy to adjust to different heights for user comfort. They should be compatible with different laptops, notebooks, and tablets. Mobile hospital carts are outfitted with desktops and keyboards, but those must be connected to the network. Each cart must have a good signal with the base station in order to function correctly and without any delays. Otherwise, the system may not be completely up to date if one of the cart’s systems is not communicating with the network in real time, possibly resulting in a shortage of medication. Carts should be equipped with some kind of long-lasting power source, such as Lithium battery technology. This long-lasting power technology should be either chargeable or swappable, so there will always be power available for the cart. The best mobile lab carts on the market will have all of these characteristics, making them a great choice for any healthcare setting. Healthcare personnel will love the ease and flexibility good carts afford to them when treating patients and moving from room to room. They will be able to focus less on the little things such as moving equipment and medications and focus more on what is really important- improving the health of others. Previous Can You Recycle Surgical Implants?